Wilfred Stanley Pettitt was born in Great Yarmouth in 1904, the fourth child in a family of eight; he studied at the Great Yarmouth School of Art and Norwich School of Art. When his father’s art shop in Great Yarmouth floundered during the First World War the family moved to a small holding in Reedham. This developed into the firm known as “Pettitts Ltd of Reedham” and was run by the family; more recently, having new owners, it is now called “Pettitts Animal Adventure Park”. When Wilfred Pettitt married in 1929, he and his wife, Bessie, settled at 38 Earlham Green Lane, Norwich. The year before he had the first of several Royal Academy hangings (1928-1948). 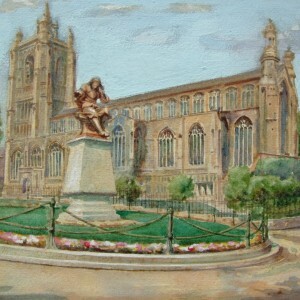 His work was also exhibited by the “Royal Society of British Arts” and the “Royal Cambrian Academy”. In the 1920’s he began experimenting in wood cuts and etchings but he was mainly an East Anglian landscape painter in oil, acknowledging Constable as an influence. The greatest impression on the young artist was made by Sir Arnesby Brown, one of East Anglia’s finest artists to whom he became protégé and friend. 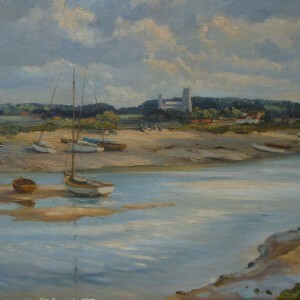 Wilfred Pettitt was one of the founder members of the “Norwich Twenty Group” becoming secretary from 1946-1948, later becoming Chairman of the Norfolk and Norwich Art Circle in 1953-1954. For over 30 years Wilfred Pettitt worked in advertising with the Norvic Shoe Company, he retired as Manager of their Norwich Studio in 1969. In 1975 he organized an exhibition of his work which formed one of the highlights of the Drayton Village Festival. His best works were of English skies and hedgerows; however he also occasionally painted portraits and did one of a former Mayor of Norwich. Wilfred Pettitt moved to Eastbourne to live near one of his sons where he died in 1978 aged 74.